Finding out about boys’ learning styles will help you to provide your boy with the absolute best chance to succeed. Just think about it. If you can learn in the way that is best for you it works better, right? I know it does for me and I have seen it work very well for my son and other boys as well. Take some time to read about the different learning styles and see what you think. I know there are ways to help your boys learn by using them. I have written posts on each boys’ learning style with information on how to tell which ones your boy leans toward, and what you can do to help him learn. Learning styles are for everyone. Since we focus on boy’s learning here I have taken the information I have learned about them along with my personal experiences, and tweaked them to fit what is effective for boys. Learning is personal so you will have to work with your boy to see what works best for him. Use these articles on boys’ learning styles to find solid information on each learning style. Find out how to tell if your boy leans toward a specific learning style (remember he may be strong in 2-3,) what you can do to honor his way of learning, and places you can take him to help him learn. Using these may well help you teach your boy in a different way – one that works so much better, and much more naturally for him! 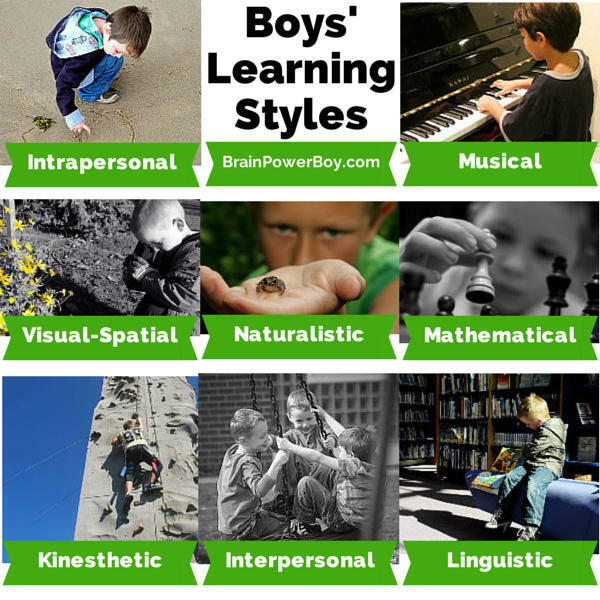 Boys’ Learning Styles Overview – an overview of all of the learning styles. Bodily-Kinesthetic Learning Style – boys prone to fidgeting or who need to be on the move in some way at all times. May be athletic but this is not always true. Interpersonal Learning Style – boys who love to interact with others. They get their energy from talking and communicating with others. They are very social. Intrapersonal Learning Style – boys who are introverted and like to spend time along. They get drained in groups and need to spend time alone. They are often very intuitive. Linguistic Learning Style – boys who are linguistic learn best through words. They often think in words, are well-spoken and usually enjoy reading. Logical-Mathematical Learning Style – boys who lean toward this learning style are number guys. They like logic, numbers and for things to be done in an ordered way. The often notice patterns. Musical Learning Style – boys who are musical, like music. While that is obvious, they also may whistle to themselves, be very sensitive to tone and types of music, have an excellent memory for rhymes and more. Naturalistic Learning Style – boys who are naturalistic are at home in the great outdoors. In fact, keeping them inside would be a struggle. They love animals, plants, and anything that takes them out and about. Visual-Spatial Learning Style – boys who are visual are sensitive to visual changes around them. The notice the small changes. They are often daydreamers and inventors. When you speak to them, they think in images. Learning Styles Writing Tips for Boys – super tips for helping your boys with writing. I’ve covered all of the different learning styles with ideas for each type so you can find the best ways to help your boy write. Play and Boys Learning Styles – how do play and learning styles come together? I’m happy to share! Read this article to learn more about how setting things up to allow for the way they play best actually enhances their learning as well. Get more boys’ learning info (and fun!) in your inbox. Sign up Now.